If you are a parent, you know the battles that can arise during the bedtime routine. It may be tempting to dismiss your child’s need to floss after tackling the bath, brushing their teeth and other nightly activities. However, flossing is in integral part of protecting your child’s smile. Don’t let the challenge keep you from making sure this task gets done each day. Flossing cleans up to 35% of a tooth’s surface that a toothbrush cannot reach. It is a critical step to prevent gum disease and tooth decay, regardless of your age. 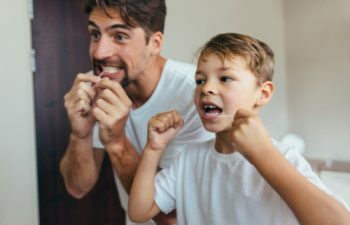 If you dismiss the importance of flossing when your kids are young, they are likely to grow up to be one of the many Americans who report that they do not floss on a regular basis. Make it Fun – Sing a song or play a game while flossing. Creativity and fun can bring positive reinforcement to a monotonous oral hygiene routine. Invest in a New Product – There are many flossing products out there that are designed for just for kids. You can find trendy and colorful flossing tools that make the task easier and more inviting. Let Your Dentist Do the Talking – Some children, especially if they are more mature, are better motivated by another adult. Ask your child’s dentist to explain the consequences of not flossing and help keep them accountable. Remember that flossing requires coordination and dexterity to be effective. Therefore, if your child cannot tie his or her own shoe, you probably still need to be flossing for them. At Georgia Orthodontics & Children’s Dentistry, we are dedicated to your child’s oral health. We are happy to help you find ways that will encourage your kids to floss more. It may take some extra planning or time, but the health of your child’s smile is worth it!